Ten years after the Camp Apache massacre, in the nearby village of Spring Forest, something awakes from deep slumber; something dark and sinister the villagers have forgotten for years. At first, they think it is the return of the Maniac from Camp Apache, but soon they discover it is an ancient Demon, able to live in dreams and transform life into nightmare. When everything seems lost, the teens discover the only survivor of the massacre is still alive... It's time to go back to Camp Apache! 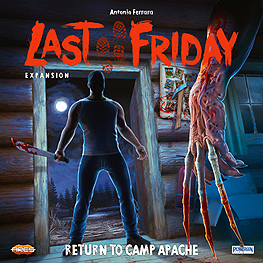 Return to Camp Apache is an expansion for Last Friday, giving you new two new chapters of challenges and enriching the experience of the base game with new ways to play. This is not a complete game. A copy of Last Friday is required to play.